As of last night, I had yet to see a really, really good documentary about HPL. I hoped this would be it. Lovecraft: Fear of the Unknown uses narration, illustrations, and interviews with experts to tell the story of Lovecraft’s life and the evolution of his thoughts and writing. What this documentary gets 100% right is its panel of HPL experts, which is formidible: Ramsey Campbell, John Carpenter, Guillermo Del Toro, Neil Gaiman, Stuart Gordon, S.T. Joshi, Caitlin Kiernan, Robert Price, and Peter Straub. (I met Peter Straub in New York City back in 2001 and tried to get him talking about Lovecraft. I failed utterly.) This is most of the All-Star Team of contemporary Lovecraft experts, and, overwhelimingly, their commentary is insightful, interesting, and sometimes very personal. 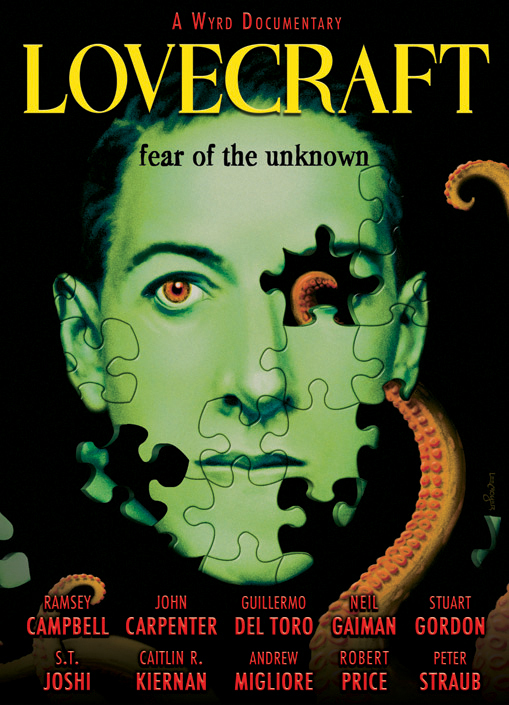 Unfortunately, it’s clear from the tone of the production that someone involved in Lovecraft: Fear of the Unknown said to himself at the outset: “Okay, Lovecraft wrote stories that were scary… Therefore… my documentary about Lovecraft must, itself, be scary!” Maybe this notion sounded reasonable in the planning phase, but in execution it’s asinine. The insightful comments of the many Lovecraft experts are interrupted again and again by boring slow-pans over illustrations of Cthulhu whilst horror-movie music plays in the background. Excerpts from Lovecraft’s stories are read aloud by a hammy actor who tries too hard to sound spooky (with the pops and crackle of an ancient phonograph inserted behind him). Photographs of Lovecraft and his friends are shown but then sometimes warped or digitally manipulated to make them “more frightening.” All of which tells the viewer nothing new about H. P. Lovecraft. I mean, the Marx Brothers were funny, right? But when you watch a documentary about the Marx Brothers, you don’t expect the documentary itself to be a comedy. You expect the documentary to tell you about the Marx Brothers. The narrator isn’t there to throw pies and have a greasepaint mustache and improvise harp solos every ten minutes. The narrator is there to tell you about the Marx Brothers. Same thing here. Lovecraft’s stories were scary, but that doesn’t mean a documentary about him needs to be.